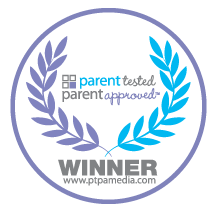 My Friend Huggles received an outstanding evaluation by PTPA members! 1) On a scale of 1-5 (where 1 is poor and 5 is exceptional), Was this product and/or content engaging? This doll is so adorable to look at, they made her with such an innocent special loving look on her face that just makes you want to smile when looking and playing with her. Not only did my kids think so but so did their mom! My kids loving playing school and loved that this doll was able to sit as a new kid going to JK just like my 3 year old twins. 2) On a scale of 1-5 (where 1 is poor and 5 is exceptional), Was this product easy to handle/ use? I have 3 girls, a 6 year old and 3 year old twins. They all loved playing with Rubi, my 6 year old loved that she wasn’t baby looking and my little ones loved that she was the same size as them. 3) On a scale of 1-5 (where 1 is poor and 5 is exceptional), Would you say that this product is durable and well-manufactured? Extremely. As a mom of 3 kids I have seen and had many toys in my house. Many of them had to be thrown away because of breaking, poor quality and not engaging for my girls. I have had my kids grabbing her from each arm and having a tug of war and Rubi is still in great condition. Even after all of the food that they have tried to feed her. 4) On a scale of 1-5 (where 1 is poor and 5 is exceptional), Overall, how would you rate your child’s level of enjoyment with the product? As a mom I enjoyed watching my girls playing with this doll, it puts a smile on my face. She is the perfect student when they play school, patient when they are doctors and little sister when they play house. Even when they are not playing with her, she sits on the rocking chair in their room to brighten the room and put a smile on their face when they walk in. 5) On a scale of 1-5 (where 1 is no/not very and 5 is yes/definitely), Do you feel this product is appropriate for the age group for which it was intended? Yes my twins are 3 and this doll is perfect for them. I think if the kids were younger it may be too hard for them to play with due to the size. I do think though that even in a baby girl’s room it would look nice set up as their 1st doll for when they are bigger and just used for decoration. 6) On a scale of 1-5 (where 1 is no/not very and 5 is yes/definitely), Are you comfortable leaving your child to engage with this product without supervision? Yes definitely. The only thing I have asked my 3 year olds is no not carry her on the stairs as she is big and they can trip holding her. So they get their big sister to do it for them. I have no other safety concerns with her at all. 7) On a scale of 1-5 (where 1 is no/not very and 5 is yes/definitely), Was the website easy to navigate and user friendly? Very easy to use and eye catching. I loved all of the colors and seeing what other dolls are available. The site was to advanced for my little ones to play on but a great tool for me to use when explain all the core values to my 6 year old. It opened up great conversations for us to talk about things that we have never really spoken about in detail but are so appropriate for her age now. 8) On a scale of 1-5 (where 1 is no/not very and 5 is yes/definitely), When taking all factors into consideration, do you feel this product is priced fairly? At first I did think the price was a bit high and thought that she should have been closer to $29.99 but after having her in the house, watching my kids play with her and seeing what she can teach them I understand the value she adds. You can see that she is well made and good quality. 9) On a scale of 1-5 (where 1 is no/not very and 5 is yes/definitely), How satisfied are you with this products educational components? A great addition to having another doll in the house. Would love to see new things and interactive games and values added all the time to keep the kids attention. 10) On a scale of 1-5 (where 1 is no/not very and 5 is yes/definitely), Based on your experience would you recommend it? Yes definitely I would. I think I would purchase this as a gift for a little girls 1st birthday so that they can keep it in their room until old enough to play with it. With respect to edu-fun toys, do we need to add more support tools for parents? As I said above I would just love to see new stuff added monthly or quarterly to give us new material to use when sitting and playing with our kids. What improvements or additions would you make to our dolls? To be honest there is nothing that I can think of that I would add. Maybe just a variety of looks so that kids can get dolls that are just like them. 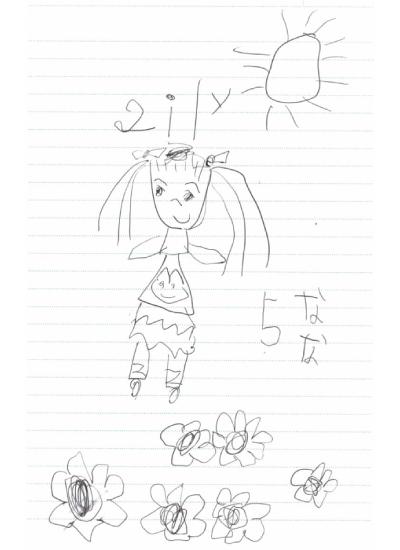 Having travelled all the way from Japan with her distributor parents, five year old Nana fell in love with Lily at the Kind + Jugend Trade Show this September. Germany’s Kind + Jugend Trade Show for Kids’ First Years is a leading international fair for infant’s and children’s hardware, toys, maternity wear and kid’s clothing. 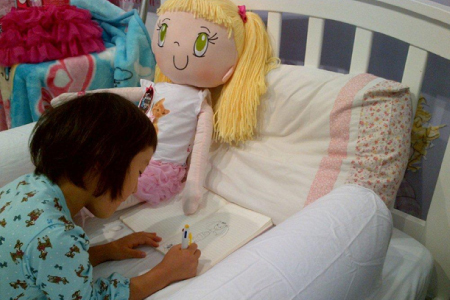 Creator of My Friend Huggles, Brenda Katz sits with Hana while she proudly displays her drawing of her new friend Lily.